The use of human subjects in biomedical research has increased rapidly with scientific discoveries. However, the failure to achieve the highest - or even adequate - standards of professional moral concern and behavior is a serious side effect. Research on Human Subjects is based on four years of intensive research in which two studies were completed - one on a nationally representative sample of biomedical research institutions, the second on a sample of 350 researchers who actually used human subjects. The authors explore prevalent ethical norms, the actual ethical behavior of scientists, and the dilemma between the values of humane therapy and scientific discovery. They document the inadequate training that biomedical researchers receive in the ethics of research on human subjects, not only in medical schools but in post-graduate training as well. 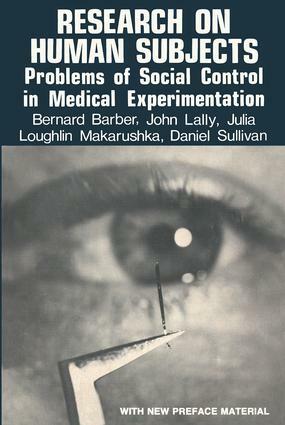 This landmark work makes very specific suggestions for policy change and reform for the biomedical research profession and its employment of human subjects.